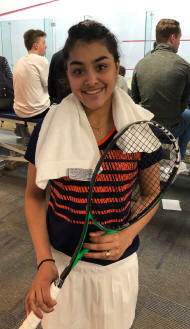 Hania, the new kid on the block! Hania El Hammamy won her first PSA Challenger Tour 30 event in Cincinnati tonight, her largest PSA tour victory to date, but it is surely just a sign of a decorated career to follow for the talented eighteen year old. 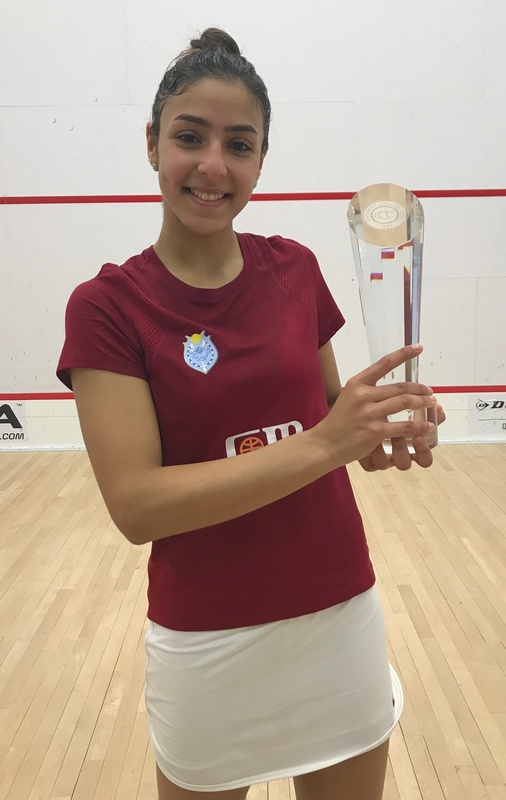 The Egyptian teenager has had an incredible start to 2019, first winning the British Junior Open in January and now she has back to back PSA titles in Scotland (Tour 20 event) and now in Cincinnati. Hania’s only loss of 2019 came at the hands of Nour El Sherbini at the Tournament of Champions, and even then she got a game. When being interviewed after the match, Hania told the packed crowd in attendance that she had read the reports of the semis where her error count had been eluded too. She decided to make a conscious decision to fix it today and fix it she did as a near flawless performance took her to the title without the loss of a single game this week. It wasn’t that Vicky played badly either, she may have been lacking a little confidence with the injured ankle still heavily strapped, but the fact she was even in the final showed she wasn’t too far from her best. 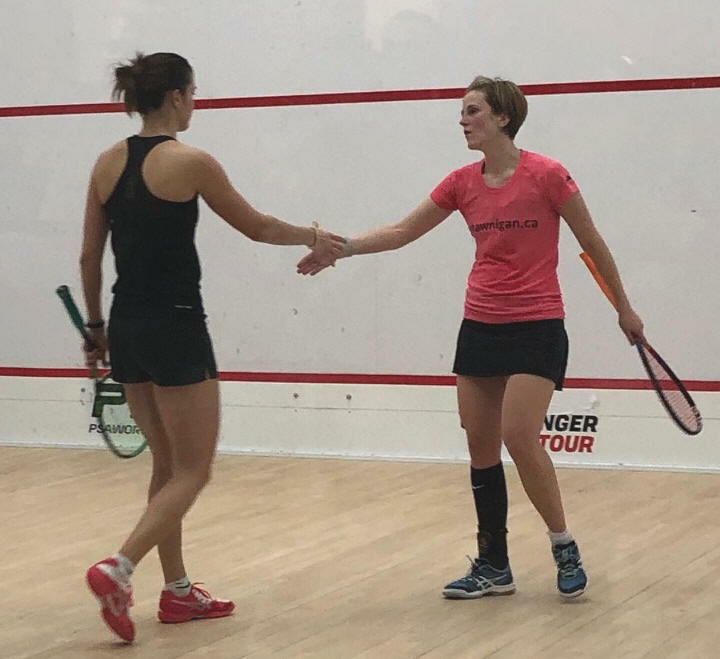 For Vicky it is a second straight Gaynor Cup final loss and she may have thought twice about coming back for 2020, but the announcement by Vere Gaynor, title sponsor for the tournament, that the Gaynor Cup will be a $50k event next year may have just convinced her to return. 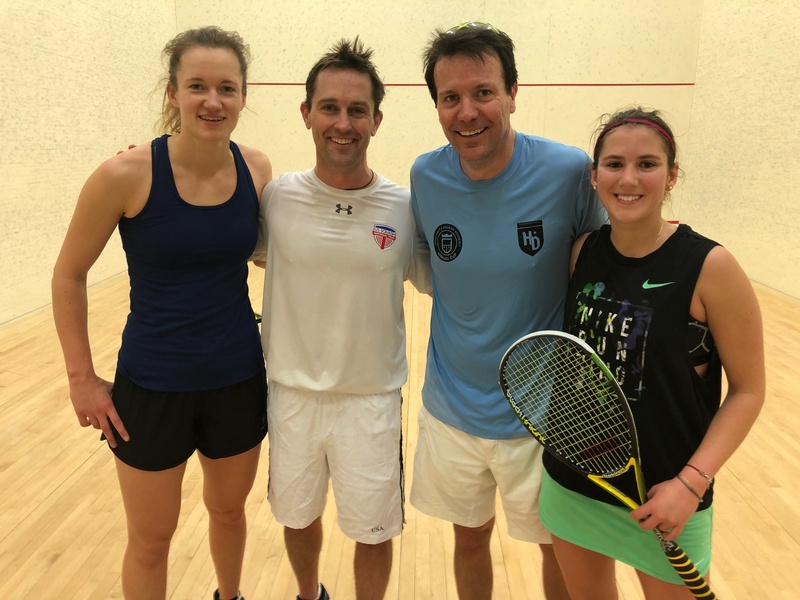 It was a great week of squash with the PSA players in town for the week putting on a great show on the court and also representing the World Squash Tour in impeccable fashion. 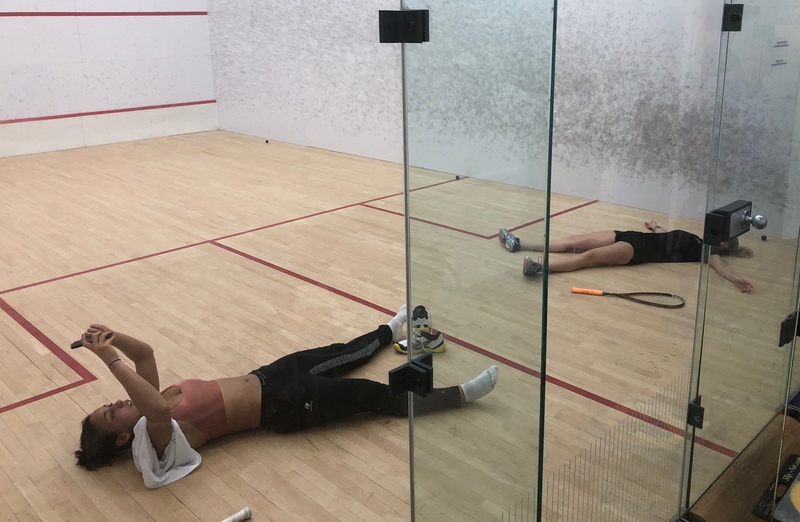 The enjoyment the sponsors had playing the pro’s that lost in the early rounds in both singles and doubles made the week the true highlight of the Cincinnati squash calendar. Samantha Cornett and Hollie Naughton both fell at the hands of their higher seeded opponents on Saturday in Cincinnati but they didn’t go down without a fight and should be proud of the quality of their play. Vicky, who squeaked past Nadine Shahin last night, will once again be thanking her lucky stars after surviving another major test. The top seed cruised through the first game and held a big lead in the second as it looked like we were in for a long intermission between matches, but then Samantha became more aggressive with her shot selection and despite narrowly losing the second, she took charge of the third and fourth, with only desperate retrieving at times from Vicky keeping her in the games. With the score tied at 5-5 in the fifth you could hear a pin drop in the crowd such was the tension courtside. A couple of errors from Sam gave Vicky the edge and she never looked back as she booked her place in the Gaynor Cup final for the second straight year. 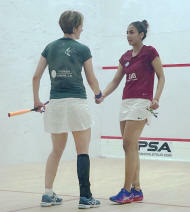 Unlike Vicky, Second seed, Hania El Hamammy, has not dropped a game on her path to her first Gaynor Cup final. It was not easy though today taking 41 minutes to get passed Hollie Naughton, who was appearing in her first 30K semi-final. Both the second and third games went to 10-10 with Hollie having game balls to extend the match. 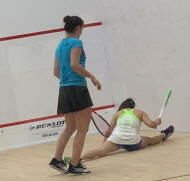 The court coverage from Hania was stunning and at times Hollie must have wondered what she needed to do to win a point. 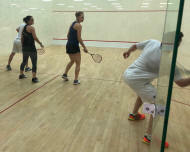 There were a few errors from the young Egyptians racquet each game though which kept Hollie interested. She may need to tidy up the error count if she is to lift the title tomorrow. 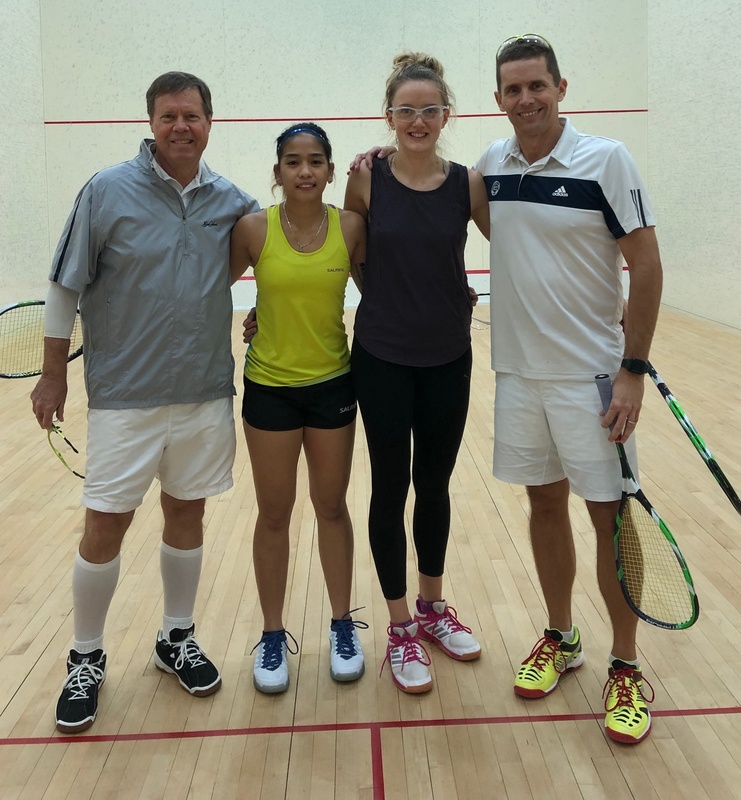 In the Pro Am doubles Jemyca Aribado from the Philippines won the B division with partner Bill Gearhart and Columbian, Catalina Pelaez, won the A division with Harrison Mullin in an entertaining hour long match. 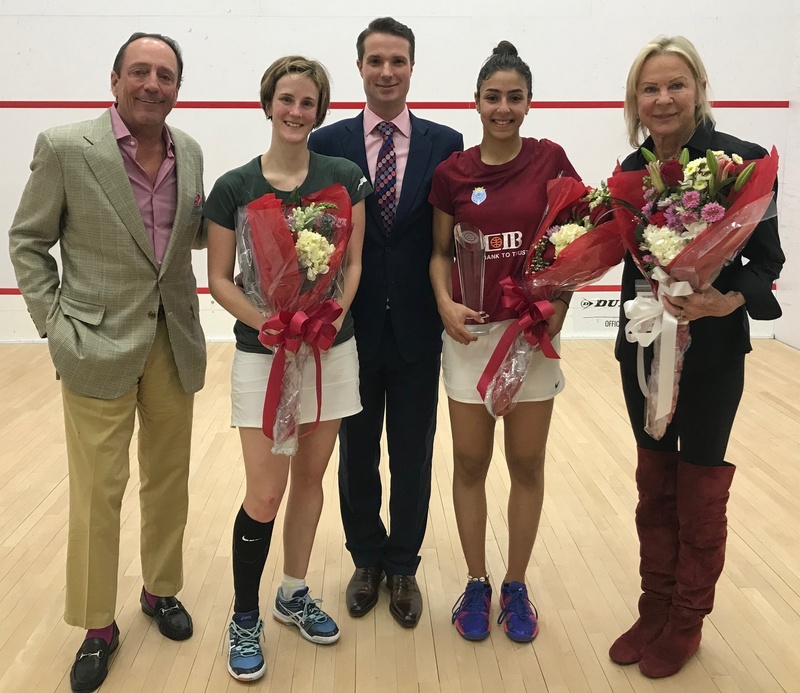 It was a great night for Canadian squash as the hopes of a first American winner of the Gaynor Cup were dashed aside in Cincinnati. Eighteen year old, Hania El Hamammy, showed how she has climbed so quickly up the rankings, beating last year’s semi-finalist and compatriot, Mariam Metwally in straight games. A tired Metwally retired in the third game after pushing hard to tie the match in the second. 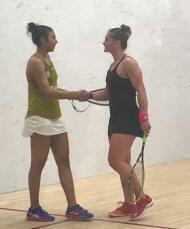 Her opponent was just too agile on the day for Mariam to get the results she needed from her shot making and the retirement just hastened the inevitable victory. 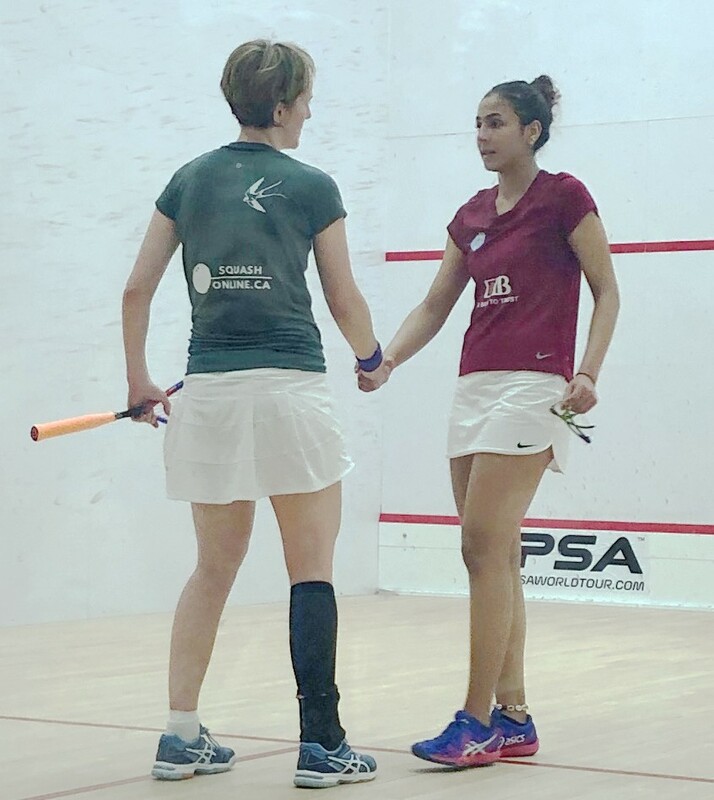 Hania will face surprise semi-finalist Hollie Naughton (riight) tomorrow after the Canadian number two came from two games to one down against home hopes Olivia Blatchford Clyne. Olivia looked to be in control of the match after taking the second and third games with relative ease, leaving Hollie to scramble to no avail. Hollie picked up the pace and power though in the fourth and what seemed like an unlikely comeback stunned the crowd as she ended Olivia’s title hopes. During the previous match Hollie’s Canadian team mate, Samantha Cornett, also produced a great upset to clutch victory from the closing jaws of defeat. At one game and 10-6 down it looked a mountain to climb for Samantha, but a crucial turn of events saw the match tied at one game each. This was maybe the highest quality match of the tournament so far with both Samantha and Emily Whitlock both producing tight drives and accurate winners from all areas of the court. When Sam won the crucial third you could see Emily’s head drop enough for Sam to take the bull by the horns and finish the job. Top seed, Vicky Lust, lives to see another day escaping a scare in the first match of the evening. 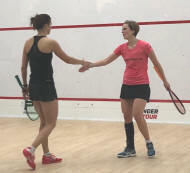 This was the third encounter between Vicky and Egyptian Nadine Shahin. 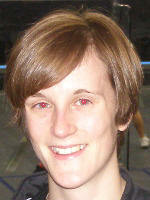 In the prior two outings Nadine had held 2-1 game leads before Vicky edged her out for the victory. Incredibly lightning struck three times for Nadine, as again with a 2-1 game lead, Vicky was able to dig deep and turn the match around setting up a semi with Samantha tomorrow. 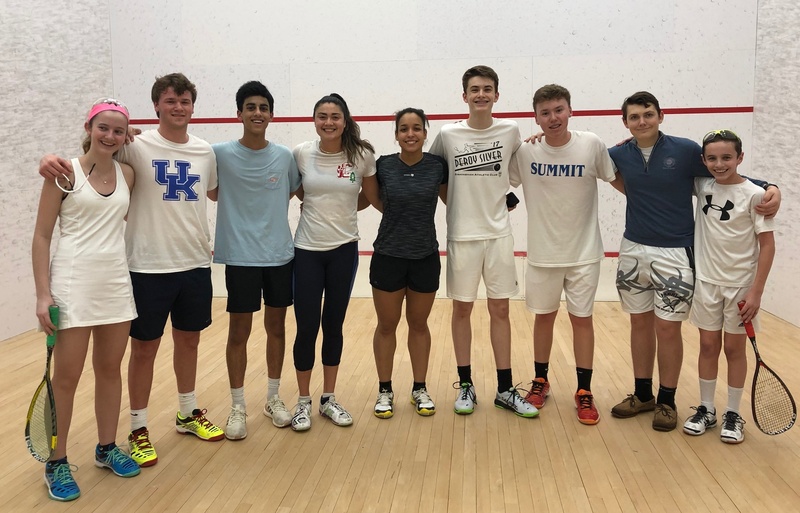 While the top eight seeds dueled on the show court, the earlier tournament losers competed in a fun but competitive Pro-Am hardball doubles with the Cincinnati sponsors. It was great seeing the versatility of the PSA players. Storms rocked the Midwest skies today, but all the seeds found the waters to be calm sailing as they cruised into the quarter finals without too much duress. 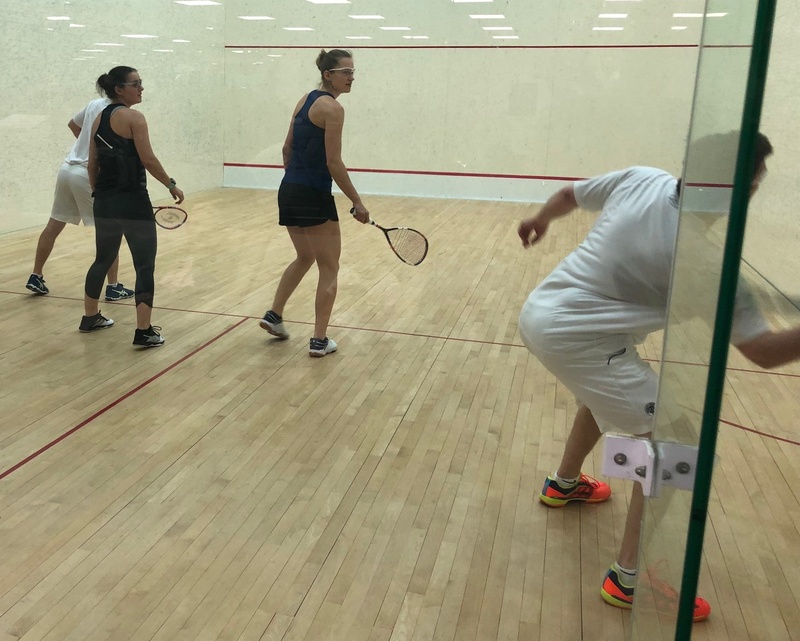 Home hope, Olivia Blatchford Clyne and sixth seed, Nadine Shahin, both had early wakeup calls after losing their first games, but they were able to steady the ship to progress. 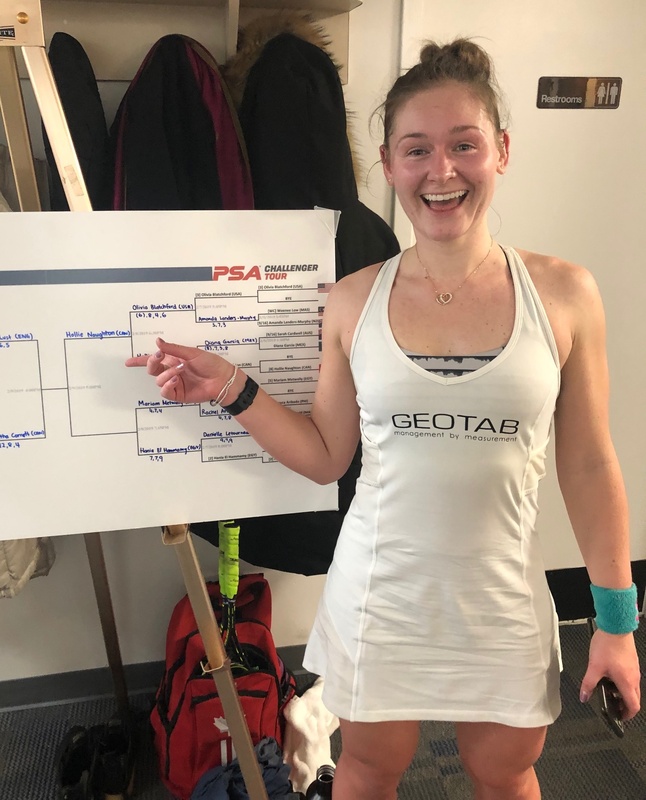 Vicky Lust will probably be the happiest of the seeds to move on as an ankle injury picked up in the semifinals of Cleveland last week, could have proved to be too painful to play on. Thankfully the top seed was able to move with more freedom as the match progressed and she will enter the quarter finals with more confidence. It will be tough to pick a winner out of each quarter final match-up with all the top seeds looking so comfortable today and tough to pick the tournament favourite overall. Tomorrow we will see who throws down the gauntlet to the rest of the field as we move into the business end of the event. Pictured 2 pics> Caption: While the competition was taking place on the show court, the losers of the first round kept the sponsors junior players happy by taking them on court to play the pro. Emily and Olivia amazed she can touch the pedals!! There were three upsets on day one in Cincinnati including a 72 minute marathon to start proceedings. Former under 23 Scottish Champion, Alison Thomson, fought off three match balls against New York’s Haley Mendez, before ending their battle with a fully stretched out pick up that span off the frame and ended inches above the tin with spin at match ball. Haley was not the only seed to fall though as Sunanya Kuruvilla produced an excellent display against Canadian, Nicole Bunyan. The nineteen year old from India had a real pep in her step as she combined youthful retrieving with skillful shot making. Diana Garcia produced the third upset of the night, working Sarah Cardwell corner to corner in a crucial second game which she won when already a game down. The resulting fatigue to Sarah’s legs seemed to be the difference for the rest of the match as Diana was able to dominate the T and get a good hold on the match. 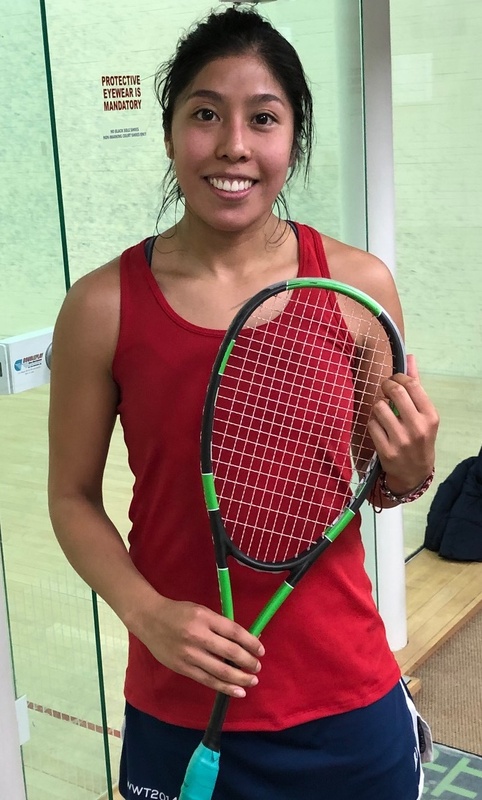 Local Cincinnati professional, Weenee Low, was unable to add to the upsets, despite a good spell in the second game where she held a 6-2 lead and looked to have her opponent in trouble. Even doing the splits on the court couldn’t fend off the comeback though as she went down in three games. The remaining seeds all progressed with relative ease and will find the going a lot tougher as the top eight seeds join the action tomorrow. 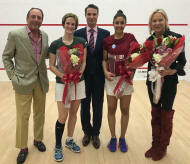 England’s, Victoria Lust (right), heads the field in Cincinnati this week for the third annual Gaynor Cup. Lust, a finalist in 2018, will have tough competition though with three other players in the World’s top 20 playing the event. 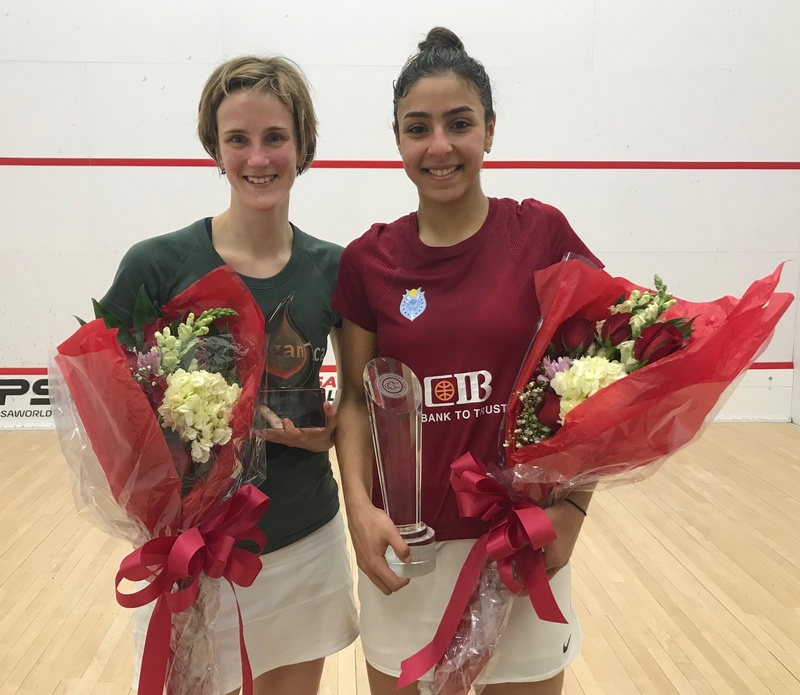 Second seed, Hania El Hammamy, is in form and will be looking for back to back tour titles in February after her victory over Olivia Blatchford Clyne in Scotland last week. Play starts on Wednesday, so the courts will be heating up after the recent Midwest arctic freeze.